Although over-the-counter drugs and prescription drugs have an important place in hay fever management, many people turn to alternative treatments to support or sometimes even replace drug based treatment plans. Acupuncture and herbal types of medicine can be very helpful for managing hay fever and can successfully provide relief from your painful symptoms. 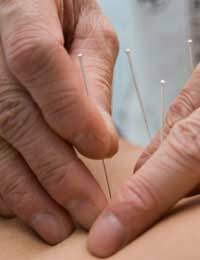 Acupuncture has a lengthy history of pain relief but its applications are much broader. Despite there being few studies showing concrete evidence of its benefit to hay fever, there is a great deal of anecdotal evidence supporting its use. It works through the insertion of needles into the skin, which is thought to stimulate 'pressure points' and thus relieve pain and enhance well-being. Its application for hay fever is believed to affect the body's immunity and as such, it helps to reduce the immune response to an allergen. Supporters of acupuncture for hay fever cite its benefits as including immune system strengthening and better regulation of the body's immune response. Increased energy is another benefit that is thought to result from acupuncture treatment, which can help if you find that hay fever medications leave you feeling lethargic and sleepy. To treat skin irritation such as redness and swelling, consider using Aloe Vera gel to soothe skin. You can also keep an Aloe Vera plant and squeeze the gel onto the affected area. It's an excellent topical treatment for irritated and sore skin. This herbal extract is believed to have an antihistamine-like effect on hay fever symptoms and is thought to be very effective. It also doesn't have the sedative effects that are often associated with antihistamines. One particular Swedish study found that butterbur was as effective as antihistamines in treating hay fever symptoms, although further research is still needed before it is recommended as a substitute for antihistamines. Gingko biloba is thought to decrease the body's response to allergens while also increasing energy levels and circulation. It's available in most health food shops and is usually taken in capsules. Liquorice root can be quite helpful to treat the nasal symptoms of hay fever. It can ease inflammation and redness in the nose and is also believed to have anti-viral and anti-bacterial properties that can help the body's immune response to hay fever. Eucalyptus is an excellent remedy for clearing the nose and breathing passages. This herb can also be used in a steam treatment to relieve congestion. It has an immediate effect and simply inhaling the fragrance can begin to clear the nasal passages. Although the treatments described are generally considered quite safe, they can amplify the effects of drug treatments you may already be taking for hay fever. It's wise to tell your doctor about any herbal or homeopathic remedies you are taking or intend to take to ensure that you don't suffer from a drug interaction. There is a common but mistaken belief that natural treatments are always safe and cautions must still be applied to their use. Many people prefer to enhance or replace drug-based treatments with alternative ones. In particular, side effects from drugs can be very unpleasant and alternative treatments tend to have fewer and milder side effects. You may also find that alternative treatments actually help to alleviate the side effects, such as headaches, that occur from drug treatments for hay fever. All of these tools are important to consider in obtaining the best possible treatment for your hay fever symptoms.